Twitter for iOS and Android just received a new update respectively! Photos: When adding a photo to your Tweet, you’ll see a full preview of the photo. There’s also an easier way to share a photo from your camera roll, just click the photo icon on the bottom right corner of the Tweet box. Accounts: When you compose a Tweet, you’ll see your avatar and username so you won’t get confused on which account you are tweeting from. Location: You can still add or remove your location from individual Tweets right from the Tweet box. 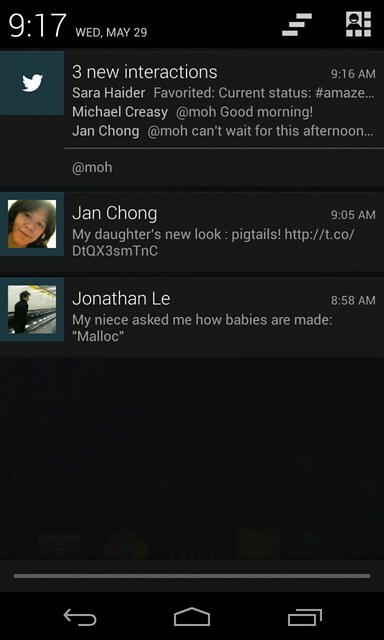 One of the most requested features we’ve heard about from Android users is richer notifications. With this update, you will now see more details about your interactions on Twitter right in the Notifications Drawer. Just swipe the notification to expand and see more details. You may notice that we’ve removed the borders around timelines on Twitter for iPhone, just as we’d already done on Android, so your Tweets now fill the screen. You can download Twitter from Appstore and Play Store for free.